Julius Richard Scruggs was born in Elkton, Tennessee to the Reverend and Mrs. Earl Scruggs, Sr. and reared in Toney, Alabama. He is a graduate of Council Training High School in Huntsville, Alabama. After earning the Bachelor of Arts degree at American Baptist College in Nashville, Tennessee, he also completed requirements for the Master of Divinity (M. Div.) and Doctor of Ministry (D. Min.) degrees at Vanderbilt University School of Divinity in Nashville. On December 9, 2011, he received the honorary degree of Doctor of Humane Letters from Alabama Agricultural and Mechanical University, Normal, Alabama. His pastoral experience began at age 18 at Pine Grove Missionary Baptist Church (Harvest, AL) where he served 1960-1965. From 1965-1972 he pastored the Mt. Ararat Baptist Church (Nashville, TN). He continued to follow the Holy Spirit’s call and pastored the Antioch Baptist Church (East Chicago, IN) from 1972 to 1977. Since January, 1977 he has been the shepherd of God’s people at First Missionary Baptist Church in Huntsville, Alabama. He is a man of deep social consciousness, which is apparent in his contributions to religious and community causes. He is a member of the Board of Trustees at American Baptist College, member of the National Board of Directors, NAACP, former board member of Selma University and former President of the Alabama State Missionary Baptist Convention (President Emeritus). Locally, he is a member of the Mayor’s North Huntsville Leadership Advisory Council; the Huntsville Human Relations Commission; member and former president of the Greater Huntsville Interdenominational Ministerial Fellowship (GHIMF); 100 Black Men of America, Inc. Greater Huntsville Chapter; Sigma Pi Phi Fraternity, Inc., Epsilon Kappa Boule’ and provides advisory support to a wide range of community movements. On September 9, 1999, Dr. Scruggs was elected Vice President-At-Large of the National Baptist Convention, USA, Inc. As a part of the leadership team, he helped to bring vision, integrity, structure, and accountability to the largest Black church organization in the nation. His accomplishments have been recognized in “Who’s Who in Religion,” “Outstanding Young Men in America,” “Personalities in America Hall of Fame,” “Named one of the “70 Most Influential Black History Makers,” 2012. Additionally, he is the 1998 recipient of the Dr. Martin Luther King, Jr. Award presented by GHIMF. Dr. Scruggs is much sought after for his biblically-based, doctrinally sound, and life-centered preaching and teaching. His servant-leadership style and his personal integrity have molded and shaped the thrust of First Missionary Baptist Church’s Christian Education emphasis, outreach ministry, stewardship commitment, physical growth and spiritual maturity. During his more than thirty-seven (37) years in the pastorate at First Baptist, the church has initiated witnessing/evangelism teams, jail ministry teams, scholarship funds, and health fitness and recreation ministries. The Christian Education ministry has been enhanced with weekly Bible study for all ages, and a licensed Child Development Center and Academy serving children ages 2-1/2 through fifth grade. The church property consists of a twelve-acre lot on which the church and parsonage are located and the four-phases (Sanctuary, Educational Complex, Family Life Center and Administration/Educational Wing) have been constructed. In 2009, Pastor led the church in starting the FMBC Foundation, a mission and education foundation made possible by gifts of 2 million dollars by two families in the church. More than 4,877 new members have united with the church during Dr. Scruggs’ tenure. He has led the church in giving to Home and Foreign Mission causes annually. The church has built and paid for 23 houses in partnership with Habitat for Humanity, allocated funds annually to the program, and members of the church have assisted in building fourteen other Habitat homes. 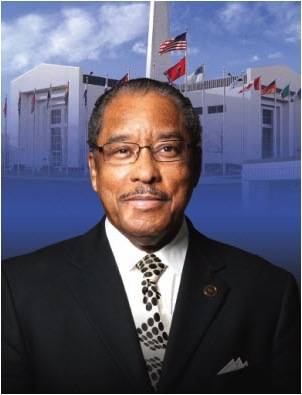 On September 10, 2009 in Memphis, Tennessee, Pastor Scruggs was overwhelmingly elected as the 17th President of the National Baptist Convention, USA, Inc. However, more significant than Dr. Scruggs’ many pastoral accomplishments and academic credentials, is his genuine love for the people of God. He is a “tender shepherd” who takes his calling seriously. He is married to the former Josephine Stewart Tipton and they are the proud parents of a daughter, Jennifer Juliette Scruggs and a son, Morris Errol Tipton, II. They have three grandchildren: Morris E. Tipton, III, Morgan Taylor Tipton, and Elizabeth Francina Scruggs. Dr. Julius R. Scruggs, President, NBC, USA, Inc.